Back in the autumn the girls and I went on a road trip around England covering more than 700 miles in just over a week. By the final weekend I was exhausted from all the driving and solo parenting while Mr Tin Box was busy at work. This is when we turned off the A35 just past Axminster and into the familiar surroundings of Andrewshayes Holiday Park. Awaiting us was a luxury caravan with hot tub. Time to exhale! We’d previously stayed at Andrewshayes with our touring caravan in 2017 so the girls were excited to revisit the covered swimming pool, playground and games room with soft play. They were also jiggling around in their car seats more than usual because of the promise of a hot tub at this park which is in an Area of Outstanding Natural Beauty not far from the Jurassic Coast. I have to admit that after more than a week of travelling, a chilled out weekend with our own private garden and jacuzzi sounded like bliss. We arrived late and quickly unloaded a few weekend essentials into our three bedroom caravan. It’s one of the newest at Andrewshayes and felt very luxurious. In fact, it was the best mobile home we have stayed in anywhere! The caravan for up to six people can be booked for seven night stays in the high season and shorter breaks in the mid-low season. Sorry, no dogs are allowed in this caravan but Andrewshayes does have dog-friendly static caravans too. The master bedroom had a king-sized bed with bedside tables, USB charging sockets, and lighting, a dressing table with mirror, shelves and stool. There was a walk-in wardrobe with draws, hanging rail and shelves, and an en-suite with toilet and sink. The bed was so comfortable and the space was incredible after staying in a cosy glamping pod in the week before. The girls had the choice of two twin rooms and opted to sleep together in the largest of these. Both had cupboards with hanging space plus shelves and a mirror. The larger twin room had a couple of draws too – plenty of storage had we been staying longer than a couple of nights. The kitchen had a five ring gas hob and gas oven, microwave, kettle, toaster and plenty of crockery, pots, pans, mugs, glasses and cutlery. There were also some plastic cups for kids and plastic glasses to use by the hot tub. Next to the kitchen there was a table with four chairs. Something that struck me about this caravan was that it was so light. There were a lot of windows and a large patio window right across the front of the caravan. However, it still felt very private with blinds and netting. In the lounge area there were sofas and arm chairs for six people. The furniture here also included a small coffee table, wall mounted fire, and a flat screen TV with inbuilt DVD player. The soft furnishings matched throughout the caravan, giving it a luxurious feel. Outside was our private garden. We accessed this through a gate at the front of the caravan. There was a decked area, astro turf and undercover hot tub, which even in late October caught a lot of sunshine. For warmer months there were two sun loungers and a metal garden table with six seats for al fresco dining. During our two day stay we spent a couple of hours relaxing in our hot hub. The girls seemed quite happy to enjoy splashing in the warm jets of water, which I turned up to massage my aching back muscles. I was a different woman by the time I emerged. When we mustered the energy to drag ourselves away from our caravan and hot tub we popped to the swimming pool, games room and play park. 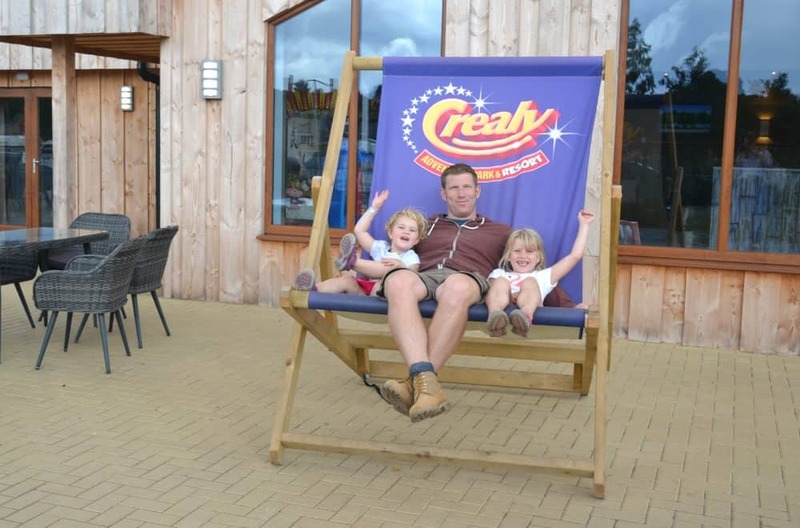 Andrewshayes has great facilities for families and if you do bring your own caravan, motorhome or tent you’ll also find clean, modern toilet blocks to use. Glamping pods are also available. We didn’t venture far this weekend, opting to relax and take advantage of the on site facilities. But if you have more time there are plenty of places to go in East Devon and neighbouring Dorest. Take a look at what we got up to during our last holiday at Andrewshayes and during our summer holiday in Seaton just down the road. I had wondered whether adding another couple of days on to an extremely packed half term break was a good idea. But by the end of our weekend at Andrewshayes I felt like a different person to the travel weary mum who had pulled up on Friday night. We loved our caravan and the private garden – it gave us the perfect space to unwind after a busy week. I’d have sat in the hot tub all day if had it not been for the fact I was rapidly turning into a prune. The caravan was spacious and modern, and would be perfect for a small family gathering or break with friends. All the holiday park facilities were a short walk away and had we wanted to explore further there were walks, beaches and family attractions aplenty. If you’re looking for a hot tub holiday in a stunning rural location with facilities to entertain the kids and the coast close by then check out Andrewshayes. Find out more about caravan and hot tub holidays at Andrewshayes Holiday Park in East Devon. Disclosure: our friend who owns Andrewshayes Holiday Park invited us to stay after I gave her some social media consultancy for the business. We were under no obligation to write a review for the blog. We enjoyed it, so we did. If you’re looking for a holiday in a luxury caravan with hot tub then pin this review of our short break at Andrewshayes Holiday Park in Devon? A caravan with a hot tub?! What an amazing idea!